We tend to make yearly resolutions or goals, setting our desires down in a tidy list that acts like a straight jacket, holding us to the promises of January 1st no matter what happens in February or July or November. Failure to meet one or more of those goals in a timely manner leads to discouragement and perhaps giving up on the resolution for the rest of the year. That’s the part that doesn’t make sense: for the rest of the year. If we break our lists down into monthly achievable segments which can be revisited and revised as we go, we have a better chance of success. It often takes only a month to feel overwhelmed by the number of tasks we’ve put on our To Do lists, the word count goals we didn’t achieve even in month one, or the weight we swore we’d lose but did not even come close. That’s when it’s time to begin again. If we mess up in January, we can do better in February. Rewrite the goals or resolutions. Aim for achievable and specific. Learn how to prioritize by day, week, month, and year. There are resources and tools to help. 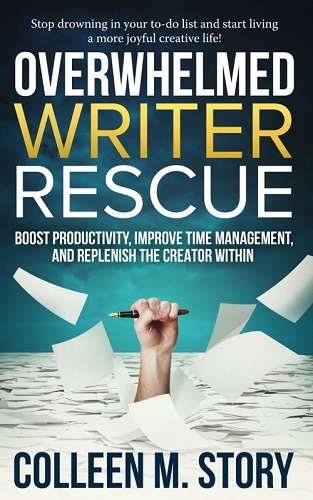 One of the books I found to be most instructive and insightful is Colleen M. Story’s Overwhelmed Writer Rescue: Boost Productivity, Improve Time Management, and Replenish the Creator Within, available in ebook and trade paperback. This book is highly recommended for anyone who’s having difficulty finding time to write or suffering from severe attacks of procrastination even when the time is available and waiting. If that’s not enough to get you going, here’s another new tool available, this one especially for those who self-publish or plan to self-publish in 2018. 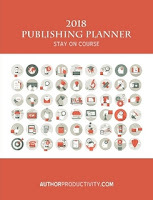 Corinne O’Flynn developed the 2018 Publishing Planner to keep her on track with her aggressive writing and publishing schedule. The first part is a Monthly Activity Planner & Tracker with each month on two facing pages, useful for any writer to track everything that needs to be done and when to do it. 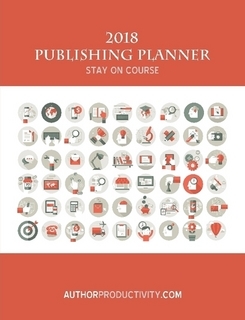 Part two of the planner is for Launch Planning and Tracking, laying out the specific requirements and timeline hints for the publish-it-yourself writer. You can see small versions of the pages at AuthorProductivity (tools for organizing your writing life). The planner is available through Lulu.com. One more helpful tool if you’re interested in word count goals and tracking is an Excel spreadsheet developed by Svenja Gosen. Svenja takes donations for the spreadsheet, but writers may download it first at no cost to see if it will be useful. We’ve set those goals or made our list of resolutions and faced January with courage and determination. Some of us will succeed brilliantly and need no adjustments when February shows up. Others will find the plan didn’t go so well. Take a look at Overwhelmed Writer Rescue. Refuse to be discouraged. Don't give up. Tweak the goals, trim the resolutions, and find a new diet plan. Every month can be a new beginning. I sometimes think I'm not dedicated enough. I don't issue daily word counts. I've done it in the past, but when I don't fulfill the goal, I feel even worse. Set realistic goals for what is going on in your life, whether children, illness, or other responsibilities. That's a sure way not to feel you've failed. I like to record word counts just for fun, but only during NaNoWriMo do I obsess over the dailies. It's stressful in November, but I always get so much done it's worth it. I definitely agree that setting monthly goals makes sense. They can be achievable, and you still feel you're making a lot of progress. I set daily goals, too, Margot, but tend to list too many so I even prioritize those. We can't do everything we want to do as fast as we want to do it. You're most welcome! Thanks to you, I'm breaking a lot of bad habits. I hope you enjoy the read, Colleen. I definitely need the planner. I could also use it for the IWSG. Good idea, Alex. I find the list of things that need to be done for indie-publishing overwhelming. For that matter, the things that have to be done for a traditional publisher can make one's head spin. Organizers and planners are great help. LOL! I also followed a rigid schedule of writing for NaNo -- mine was one hour at 9:00 and another hour at 11:00. Got me over the 50,000 mark even with a couple of days off. 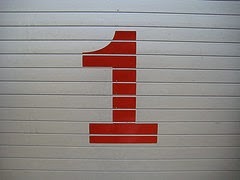 Short-term goals make far more sense than long-term ones that too often get lost in the shuffle of life's distractions. I'm giving serious thought to checking both the book and the planner. Great post! Thanks, Linda. Long-term goals are tough. I've heard of writers laying out a five-year plan, but five months makes more sense for me. Quite some time ago when I read a biography of Jack London I decided to follow his plan to write at least 1000 words a day, whether that was on a book or an article. According to the biography, London did that after breakfast and took as much time as needed to accomplish that goal. I set that as my minimum for the day, often going beyond that. However, I did not use an organizer or a planner to keep track. I just followed the word count on the computer. 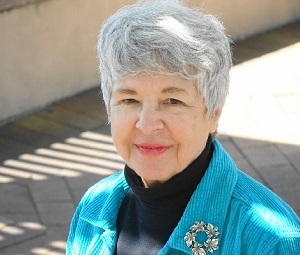 This was a very interesting, and helpful, article Pat, and it might have nudged me toward being more organized in my planning.